The merger of NYK’s liner division with Japanese compatriots K Line and MOL next April will mark “a major turning point” for the company, says its president. Mr Naito said he believed K Line and MOL “would be good partners”, given that they are “familiar with one another” and both belong to THE Alliance. 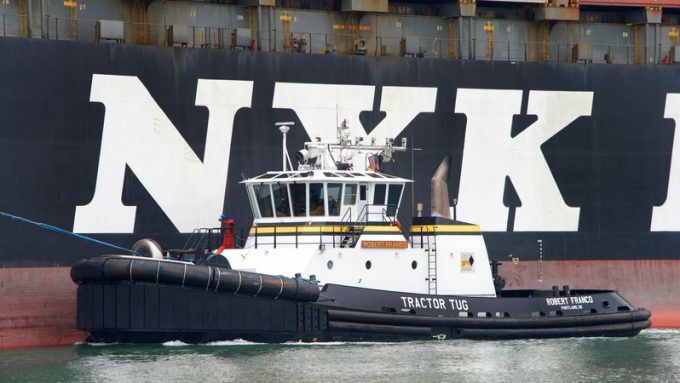 NYK, the largest of the trio, will hold a 38% stake in the merged Ocean Network Express (ONE), while K Line and MOL will each have a 31% share. “The new joint-venture company will utilise the best practices of the three companies and everything will be created from scratch,” said Mr Naito. He added that achieving synergies would require “significant effort”, but getting the joint-venture off to a smooth start was paramount, after which, “it is my expectation that the business will be able to achieve stable profits,” said Mr Naito. In keeping with most of their peers, the Japanese carriers improved their profitability in the second quarter of the year. NYK moved back into the black with a surplus of ¥5.7bn ($50.4m), K Line recorded a positive of ¥6.1bn, although MOL stayed in the red with a loss of ¥6.2bn – although this was an improvement on its ¥11.6bn loss in the same quarter of 2016. Mr Naito explained that the liner division accounted for 30% of NYK’s sales and 19% of all employees within the group. In regard to the staffing of ONE, The Loadstar understands that no final decision has yet been reached on the head count, but that individual annual appraisals have been brought forward and interviews for positions are ongoing. However, NYK Line chief Jeremy Nixon has been confirmed as ONE’s first chief executive, and will continue to be based in Singapore. Mr Naito said once the liner integration was complete, the remaining NYK divisions would be required to take over some of the functions currently tasked to the liner division, which he said included “fostering international personnel” and “acting as an antenna for new business opportunities and information, and serving as the point of contact for customers, business partners and government agencies”. He added that “starting with the liner integration, we will overcome these transformations”, and “in order to survive into the next era” pledged to introduce a new business plan and revise the group management structure “from the ground up”. After the merger, NYK, MOL and K line, currently 10th, 11th and 15th respectively in the ocean carrier rankings, will jointly leap to sixth with ONE’s combined capacity of around 1.4m teu.